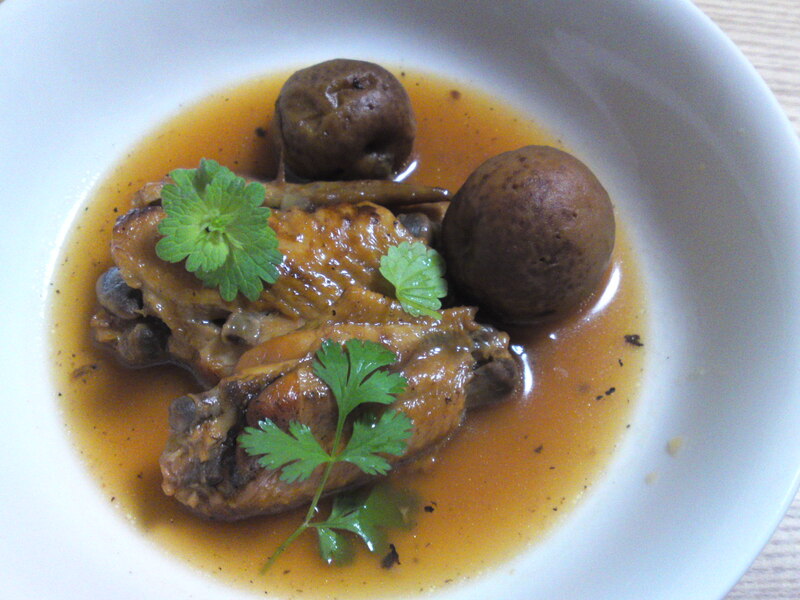 Japanese Appetizer (O-toushi/お通し): Chicken wings with Ume & Umeshu! I still have some of the umeshu/梅酒/liqueur made with Japanese plums, sake, shochu and sugar I made last year. Dragon loves to prepare chicken wings! She will fry them first on a hot fire in some oil until the skin has turned dark brwon. She will then lower the fire, lightly season the chicken wings and pour some liquid of her choice and k\let simmer under a lid for long enough for the meat to detach itself easily from the bones! This time she followed the same recipe in a STAUB casserole (French, similar to Le Creuset). As for the liquid she used plenty of umeshu! To bring further innovation she added umeshu soaked plums as well! The last were particularly unique what with the fact they were cooked with the chicken! Some flat parsley for the finishing touch! Finger-licking good! 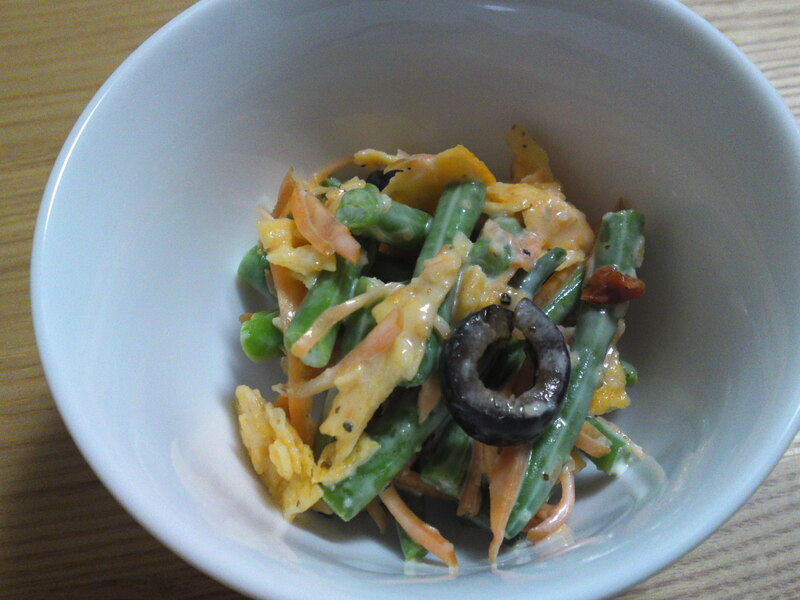 Japanese Appetizer (O-toushi/お通し): Vegetables and Potato Chips salad! Sometimes so-called junk food can be put to a good use! We always have some kind of potato chips, the dried ones sold in packages, bags, and what else! Dragon took some of a very hot/spicy kind and crumbled them into small pieces. 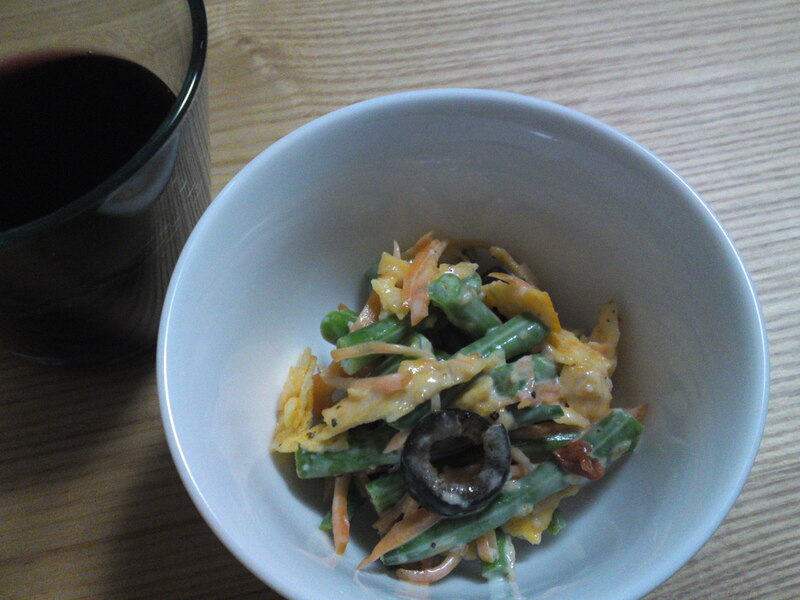 She made a salad with boiled string beans, and shredded fresh carrots, sliced black olives some mayonnaise, pepper and what else. At the last moment she added the crumbled potato chips. The dish thus conceived had a very pleasant extra crunch and zip! 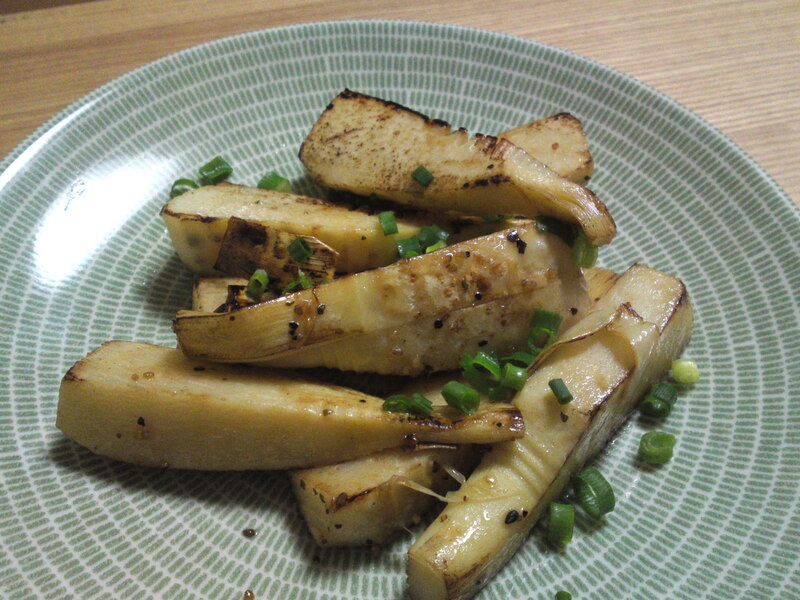 Japanese Appetizer (O-toushi/お通し): Bamboo Shoots! 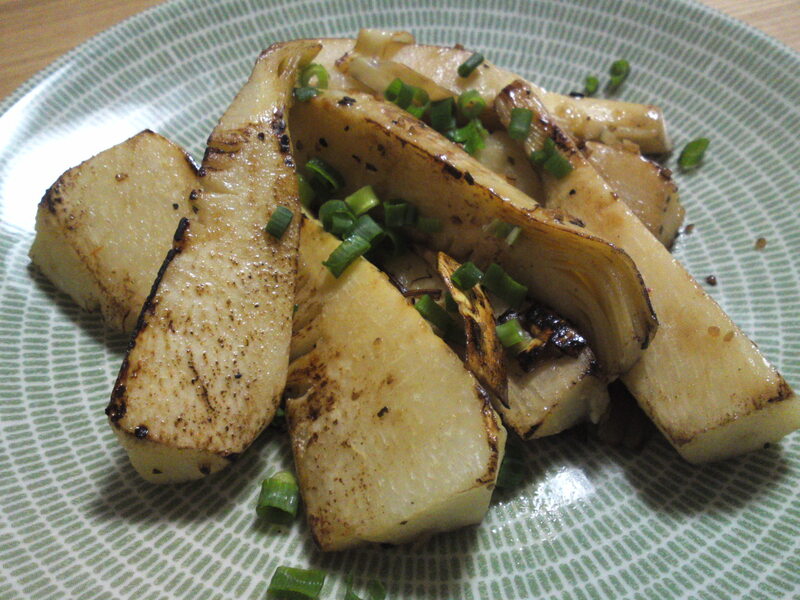 Bamboo shoots are in season, although they are going to disappear as fresh produce very soon. We still can find them raw or already boiled in supermarkets all over Japan, and especially in Shizuoka where they grow early! Dragon bought a large piece already boiled at the big Cenova market in Shizuoka City. She washed it first and then cut it in fairly large long pieces. She fired hem in a little oil and soy sauce and a little seasoning of her own until their surface became crispy and brown in some places! 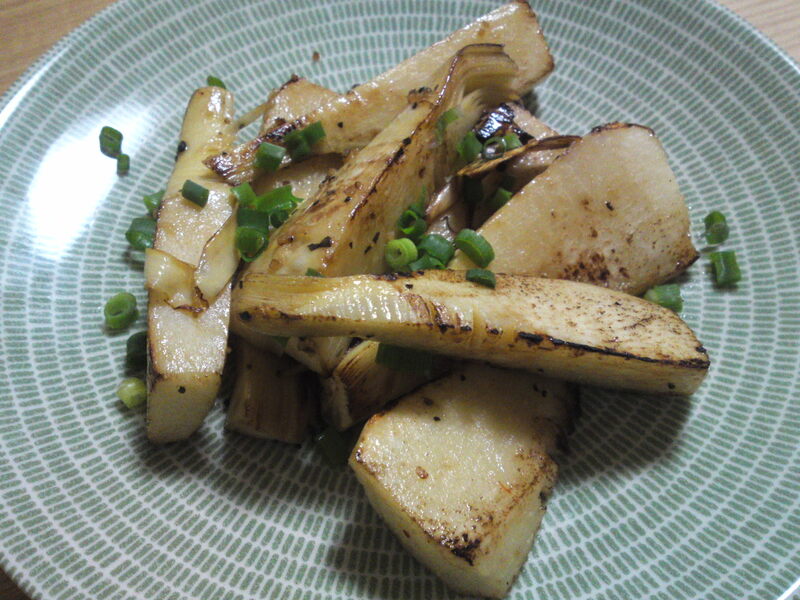 Served with chopped scallions it once makes for a tasty and healthy morsel! Vegetarians and vegans should particularly enjoy the satisfying crunch! 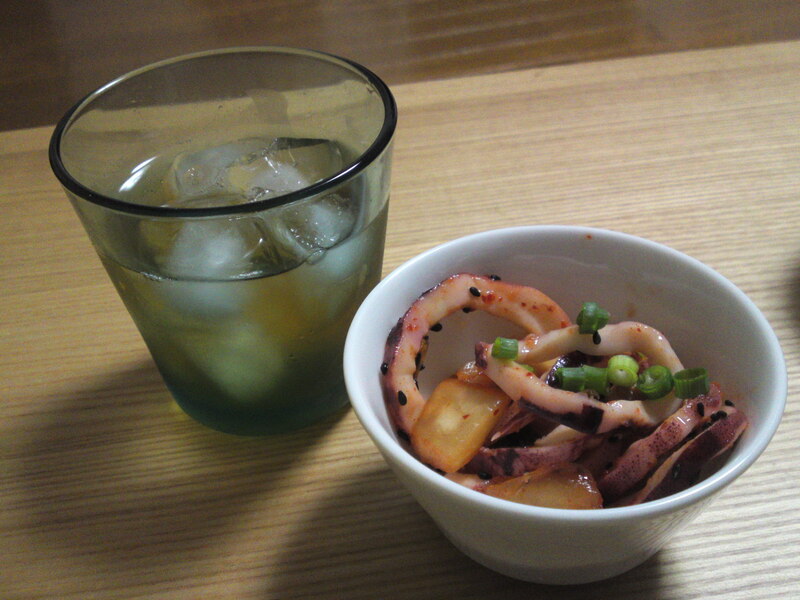 Japanese Appetizer (O-toushi/お通し): Boiled Squid and Kimchi! 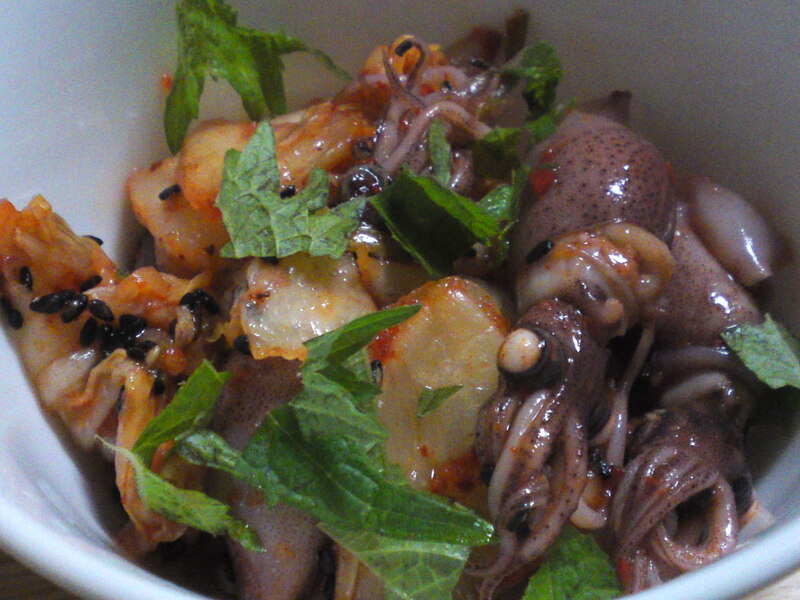 Dragon had found some boiled squid and kimchi at the supermarket. 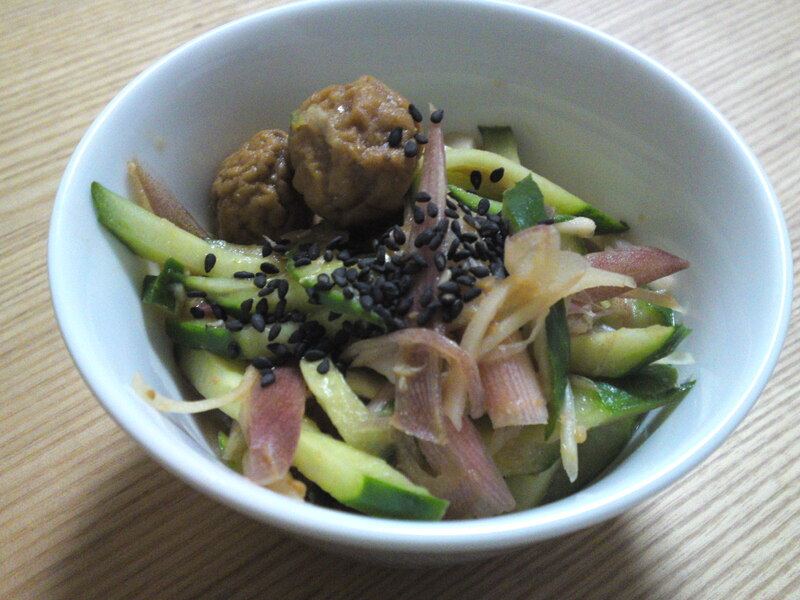 Kimchi is Korean but it is one food that all Japanese have adopted as their for a very long time! 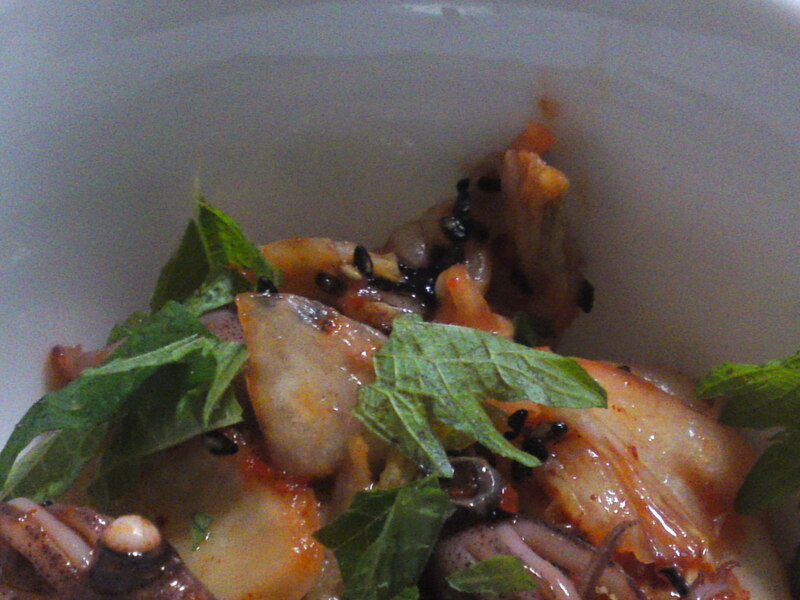 The kimchi provided enough seasoning on its own, but Dragon also added black sesame seeds for extra taste! 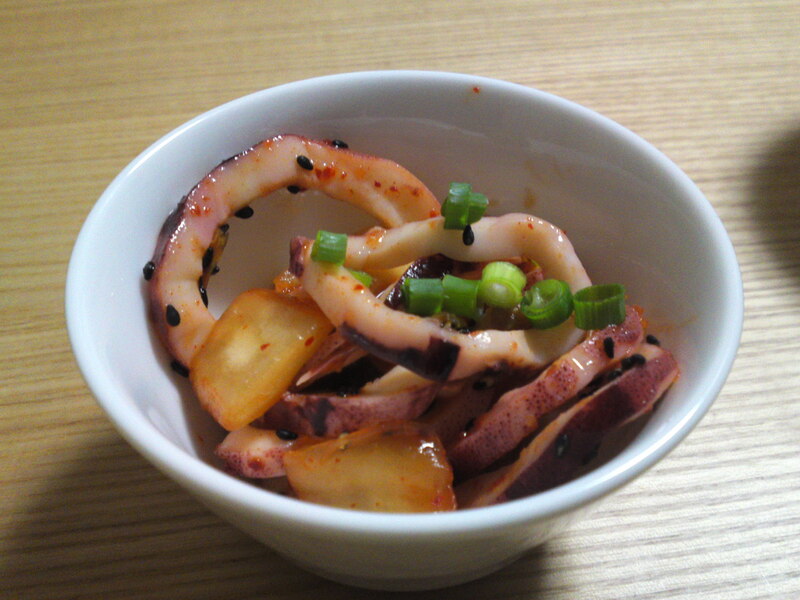 Sprinkled with some finely chopped scallions it makes for a very healthy and tasty morsel to enjoy with your drink! wine in this particular case! 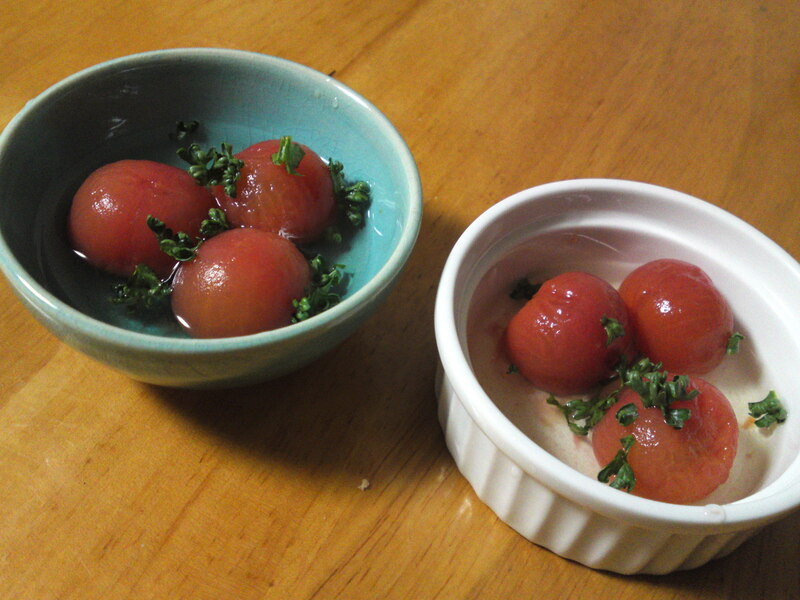 Japanese Appetizer (O-toushi/お通し): Mini Tomato O-Hitashi! When we can get plenty of small/mini tomatoes we just peel them (drop in hot water first and they’ll peel easily away!) 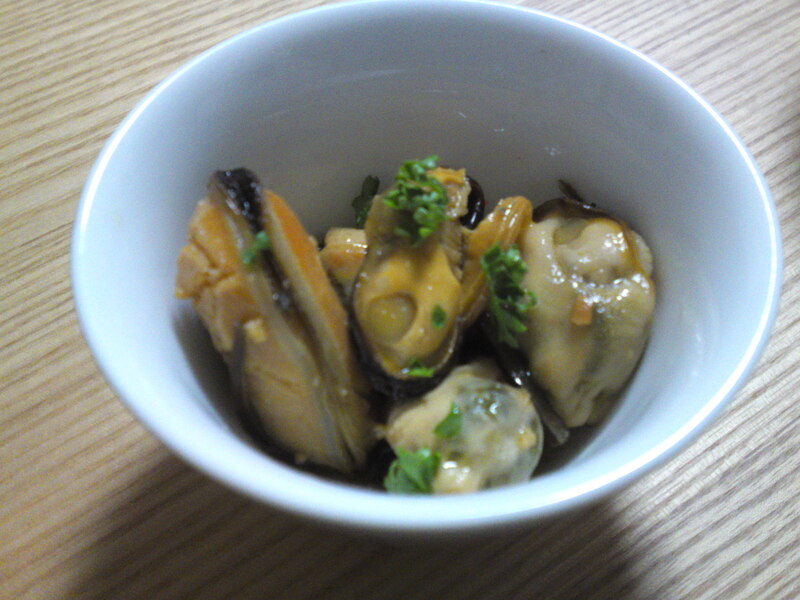 and marinate them in hon dashi/Japanese soup stock (preferably konbu/seaweed) and mirin inside the refrigerator for at least a couple of hours. 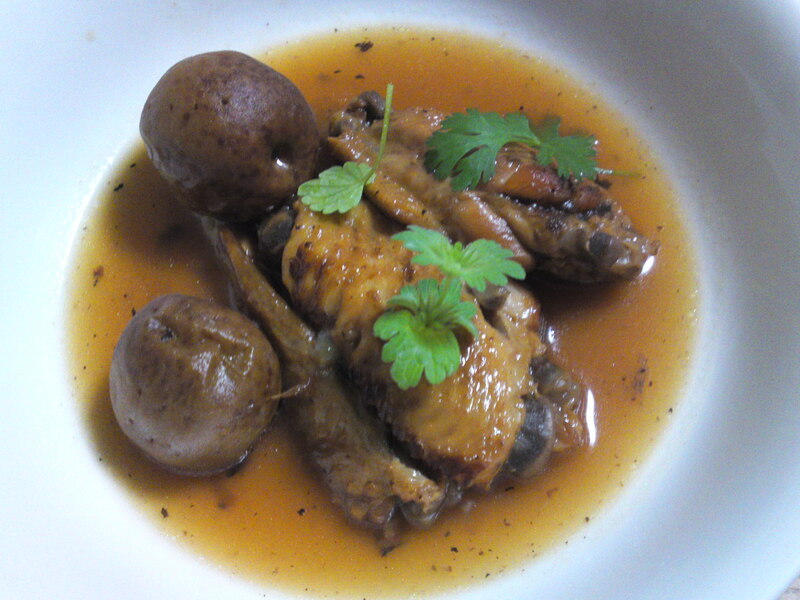 Serve them with their soup and fresh parsley! Of course, variations are infinite! Think of the presentation, too!